A New Spin on an Old Tradition: DIY Fun and Frugal Egg Hunt Ideas! Easter and egg hunts go hand in hand! Children love the thrill of running out into the yard and through the house in search of colorful plastic eggs full of treats. If an egg hunt is a yearly tradition in your house, you might be looking for ways to spice up the tradition on a budget. Luckily, there are plenty of ways to add some pizzazz to your yearly egg hunt, and they are not only budget friendly, but candy free alternatives as well! 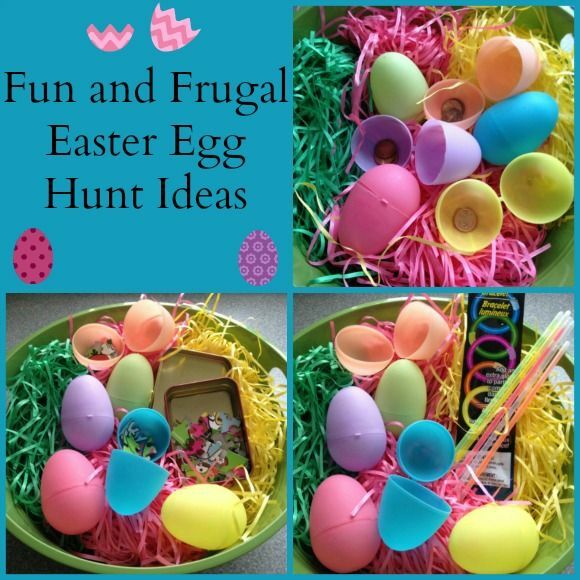 So gather your colorful plastic eggs, and take a peek at these creative ways to add some frugal and fun spark to your yearly egg hunt! You just might find one that becomes a yearly tradition! This activity is a creative twist on the traditional egg hunt. It offers a candy free alternative and really gets their little senses going! Fold the flow sticks into a “U” shape. When you snap them into the “U” they will start to glow. Fit them snug and tight into each of the plastic eggs and snap shut. Hide these in the yard at dusk, or through the house with the lights dimmed. 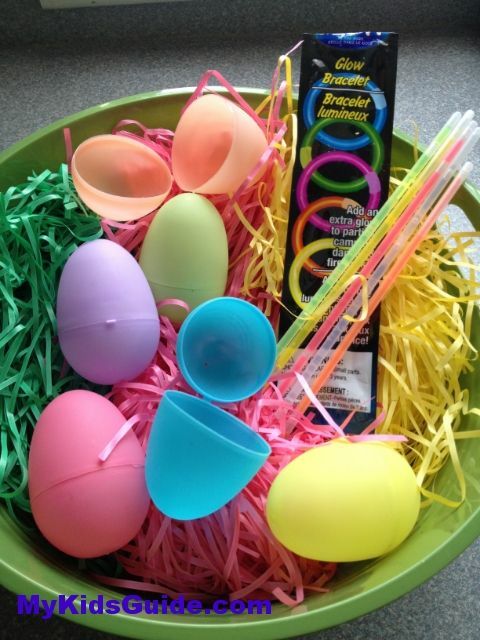 Kids will have a blast searching for the “glowing eggs” and wearing the glow sticks inside! This is a great non-candy alternative and teaches children the skill and value of team work in the process. It also utilizes problem solving skills and gross motor skills. Place a few puzzle pieces in each egg and snap shut. Hide the eggs in the yard or house. 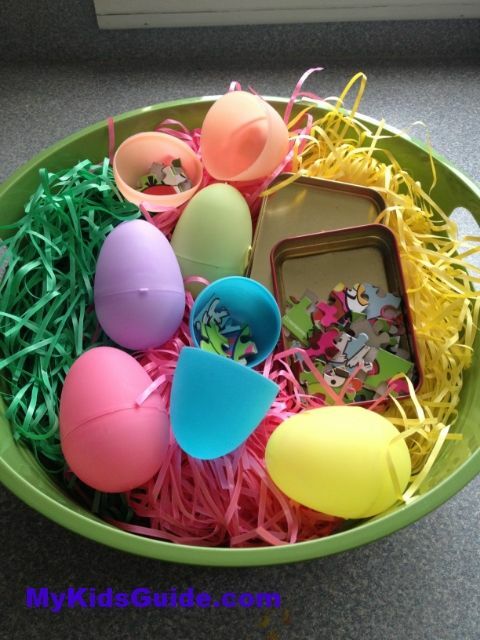 After kids gather the eggs, have them meet in a common place to assemble their puzzle pieces! A completed puzzle can yield a reward of your choice. This is a great activity to do with a large family or classroom and is an excellent non candy alternative! Children will love this “shop at home” experience as they get to spend their found “bunny money” on cool prizes! This is another great non-candy alternative and also teaches money and counting skills. 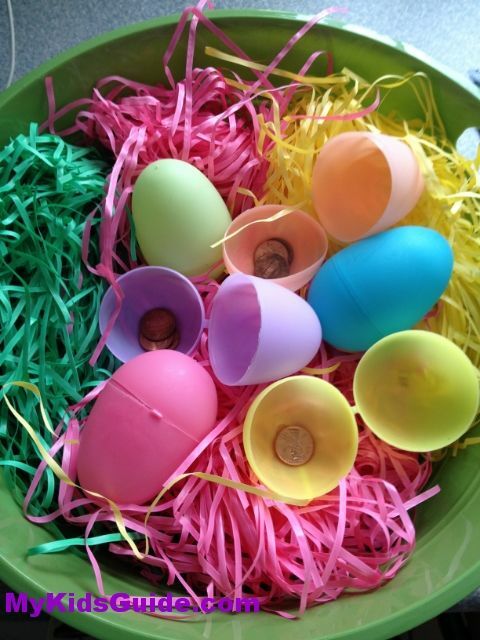 Fill each egg with a few pennies. Scatter them in the yard or house. As children gather, they will love knowing they are collecting money! When finished, meet at a gathering place and count your coins. Set up a small “store” and let the kids spend their “bunny money” on the small prizes. As you can see, there are plenty of fun and frugal alternatives to the traditional candy egg hunt. Why not give one of these ideas a try this Easter and really watch your kiddos have a ball and learn some new skills in the process? These ideas are simple, and all you need is a few items available at your local dollar store or found around your home. So give them a try, and see what fun you can have! Oh my gosh, I love all of these ideas! What great ideas. My kids love to dye Easter eggs- there is nothing like it! Great ideas! My kids love hunting for empty eggs, just for the fun of the search. What great ideas! I am definitely going to incorporate them in our annual playgroup egg hunt. Love the glowing egg idea! They are all great ideas! Great ideas. My kids always loved hunting for eggs. Eggcellent Easter Ideas. My daughter would love to learn some of these.